exercise is considered to be even more difficult, so I did some math. Firstly, I researched metabolic fat and the mechanism by which it is removed from the body and after all is said and done fat is broken down to and leaves the body through the lungs as carbon dioxide. 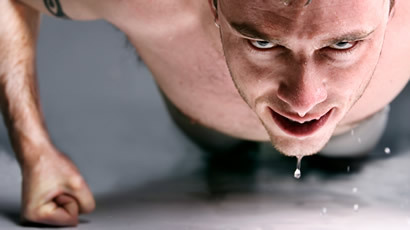 This means that you can quantify the amount of fat you are losing in a workout by examining your breathing. The basics are this: at rest the average person breathes 12-18 times a minute, during strenuous exercise respiration rises to a maximum of 45 breathes per minute. Carbon dioxide comprises about 4% of the volume of an exhaled breath. Taking an average of resting breathing rate (15) and subtracting it from the active rate of 45 gives 30 extra breaths per minute, at that rate, considering an average lung capacity of 500ml it would take 425 minutes to exhale an extra pound of CO2. 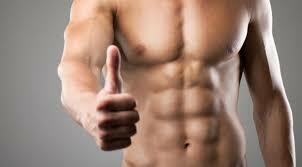 Approximately 36 minutes per day, 7 days a week would get rid of 1 pound of body fat in one week. Sounds simple, right? Wait just a minute. That’s not a 36 minute workout daily, that is a total of 36 minutes at a respiration of 45 a minute. That’s not doable with weight training or yoga or jogging. Sprinting is good, but not sustainable. Cycling will get you there fairly easily, jumping rope, once you reach a level of coordination that allows you to jump continuously for several minutes, burpees and other body weight movements are more your target. Lets look at burpees first, universally hated but good for you, you will need to do about 10 burpees in a row just as fast as you possibly can to get your breathing going, then you can start counting them, and by counting I mean counting the amount of time you keep doing them without stopping after the first 10. 15 straight burpees would be good for about 30 seconds toward our 36 minutes. Now to the jump rope, try for 1 minute without stopping, another 30 seconds of max respiration. 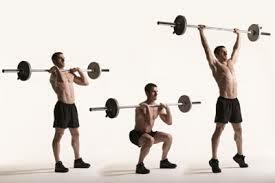 Barbell thrusters will rapidly ramp up your breathing, 15 reps without stopping will buy you another 30 seconds. 50 yard bear crawl is good for 30 seconds. This workout represents 10 minutes of the 36 minutes daily needed for a 1 pound weekly fat loss. Only 26 minutes to go. You see how much energy goes into this. Obviously, variations are perfectly OK, but the time necessary to complete the same amount of work is substantially higher. Consider jogging, let’s say you are comfortable with a respiration of 25 while running, you would have to spend about an hour and a half at that constant pace. To contrast, a 50 yard sprint full out with a walk back to the start should be good for a full minute of max respiration per lap, 10 laps would be good for 10 of your 36 daily minutes and you could be finished with it in 15 minutes or so. Cycling, with a mixture of sprinting/hill climbing and coasting will also tick down the workout clock rather effectively, although you are restricted by weather and riding environment. It is not my idea here to prove that diet is always the way to go to lose fat, I am just illustrating the fact that exercise is very involved and very much a numbers game and all about intensity, effort and commitment. If you want continued gains you have to confuse the body and keep it from adapting and lessening the effect of your workout. I felt a bit in a rut with the squats and benches every day so I am switching to thrusters and some other free weight exercises before jumping back into squatting. Need to take a day and let the body catch up. The large number of sets in the bench is beginning to tell, the last two sessions I have had to split the last set in two to finish. I had been doing one set every two minutes, I am going to go to every three minutes on the bench and see how the work goes for the last two days of this cycle. While working back up, form gets better and the payoff is seen every day the weight goes up. Small distractions that used to cause a twinge and possibly a day or two to recover are farther between. 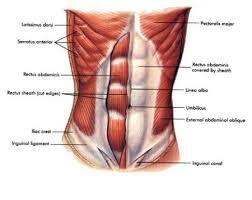 The new exercise is actually helping the heavier movements by warming up the core significantly. Working the abdominals with a dynamic movement, involving more core and not so much isolation like standard sit-ups or crunches. Makes for a very good transition from dynamic warm-up.